Happy Monday! I hope that you all had a great weekend. Yesterday I was completely enthralled with the Oscars. I started watching the pre-shows in the afternoon and stayed up way past my bed time watching the reports afterwards. And today I’ve been loving all the blog posts of people’s best dressed nominees. Today, I’m finally getting around to blogging about a polish that took me way to long to buy. 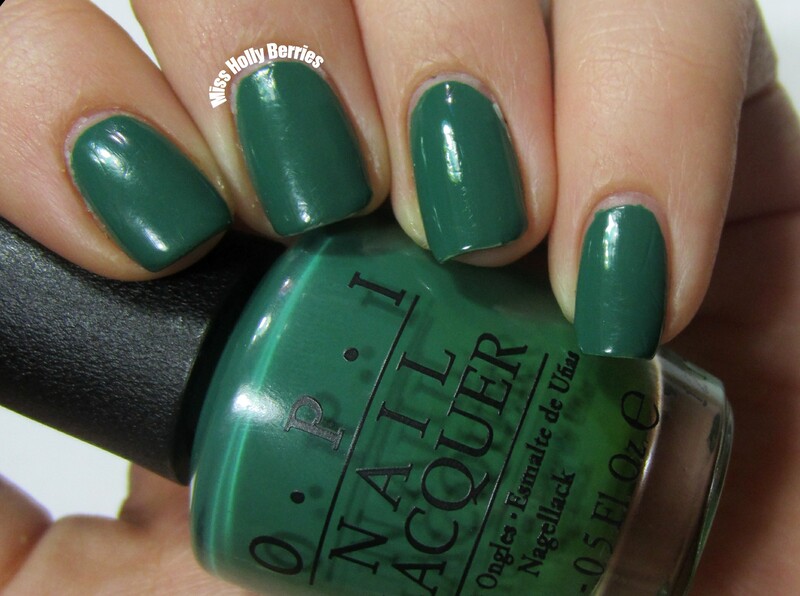 OPI “Jade is the New Black” is a primary green creme. Excuse the sheet marks in my nails. It’s another one of those situations where blown up pictures on a computer screen show me what my naked eye missed. This is one of those polishes that everyone raved about that I never bought. I always spent my money on those polishes that were new and exciting, figuring that I could buy it later. And once I bought it, I was kicking myself that I didn’t buy it sooner! The formula on this polish is amazing. It was completely opaque in 2 coats and was the perfect consistency. The dry time was great and applied like a dream. The only negative is that this polish separates really badly. So prepare your arms for a ton of shaking to get the color to be accurate. I love this polish and its a definite must have for any collection. What do you guys think? What are your favorite greens? You have been killing me with awesome polishes lately! I have been lusting after this one but I have China Glaze Holly Day, is that close enough that I don’t need both? www thank you! i don’t have holly day so i can’t compare the two when it comes to formula. but judging from the swatches i looked up online, its much much lighter. jade is the new black is like the crayola crayon version of green. if you don’t wear a lot of green, then you may not need both. but personally, i can never have enough! i hope this helps! haha thanks! and thanks for reading and commenting! No problem, I didn’t want black to think it was being replaced haha.